Reduce your VPX slot count with VPX-1, a high performance heterogeneous computing module from iVeia. This All-In-1 module can fulfill all of your SBC, FPGA, and I/O requirements in a single slot. Featuring the Zynq® UltraScale+™ Multi-Programmable System-on-a-Chip (MPSoC) from Xilinx®, the VPX-1 boasts a 1.5 GHz quad-core 64-bit ARM® architecture integrated with over 1 million programmable logic cells and up to 3500 DSP blocks. Ample high-speed DDR4 memory is connected to both the fabric and the processing system. The flexible architecture enables the VPX-1 to support over a dozen OpenVPX slot profiles, including popular SBC profiles. Sixteen high-speed transceivers can be soft-configured for multiple PCIe or 10G/1G Ethernet (and more) configurations, and can be connected to the ARM® system, the programmable logic, or to the I/O modules. Options are available for coaxial (VITA 67.1) and fiber-optic connections (VITA 66.4) to the VPX backplane. 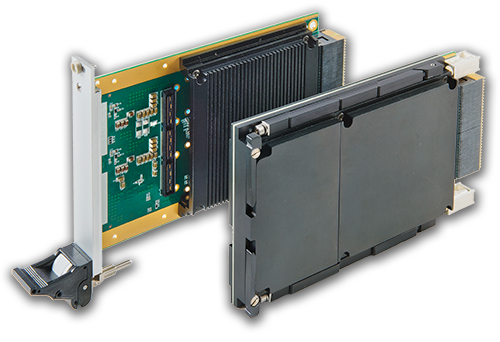 The VPX-1 supports two Type I Mini-Flex I/O modules or a single Type II module. The flexible Mini-Flex I/O architecture allows the user to combine a number of different mixed-signal and video I/O interfaces, or the user/iVeia can develop a custom module. FMC options are also available.